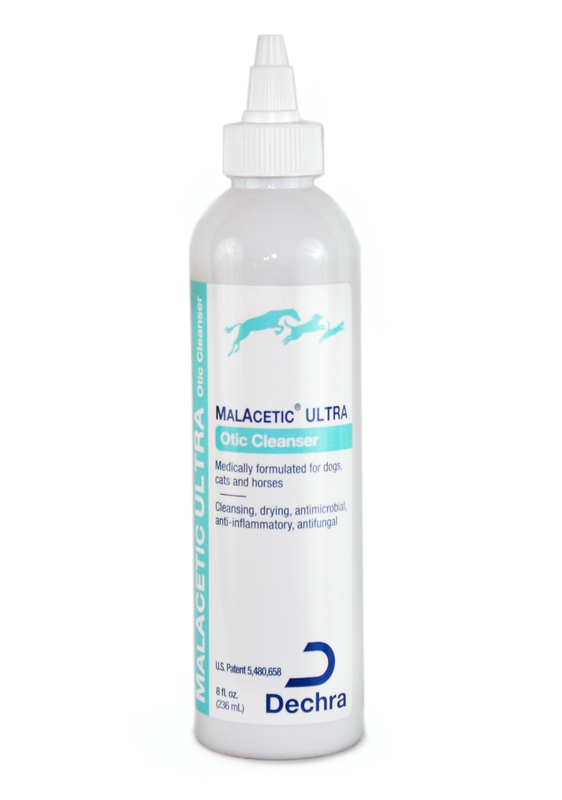 Dechra Malacetic Ultra Otic Cleanser combines itch-relieving hydrocortisone with anti-fungal and anti-yeast ketoconozole, plus the effective qualities of other Malacetic Otic cleansers. This is an all-natural, hypoallergenic, sensitive solution designed to clean ears and dry waxy buildup. This solution is a quick and effective cleanser, dewaxer, degreaser and deodorizer. Malacetic Otic contains no artificial cleansing or dewaxing agents, and no alcohol, dyes or perfumes. The pH balanced cleanser is effective against yeast and fungus and has a pleasant peach fragrance. SHAKE WELL. Apply to the ear canal and gently, but firmly, massage the base of the ear. Use a cotton ball to remove excess solution. Repeat as necessary or as directed by your veterinarian. Close cap tightly.